I can’t stop making recipes with fresh strawberries! Not only are they one of my most favourite fruits, but they are currently in season here in Canada and the U.S. They are at their peak sweetness, abundant, and also relatively inexpensive to get a whole bunch at the farmer’s market or your local grocery store. When I was young, my parents used to grow fresh strawberries in their garden. I remember them being the best tasting, deep red, and so plump… sigh. Unfortunately, I don’t have a green thumb. The plants don’t stand a chance of surviving, so I’m happy to pay for these bright red fruits. Speaking of keeping plants alive, I have a couple of houseplants that need watering. Be right back… going to water them now so they don’t die. Do you have a green thumb? Strawberry Lemon Yogurt Quick Bread: It’s a delicious, fluffy bread that’s loaded with the wonderful flavour of strawberries and lemon. Plus, I’ve got one more strawberry drink (a family friendly one) that will be ready to post on this little food blog of mine soon. 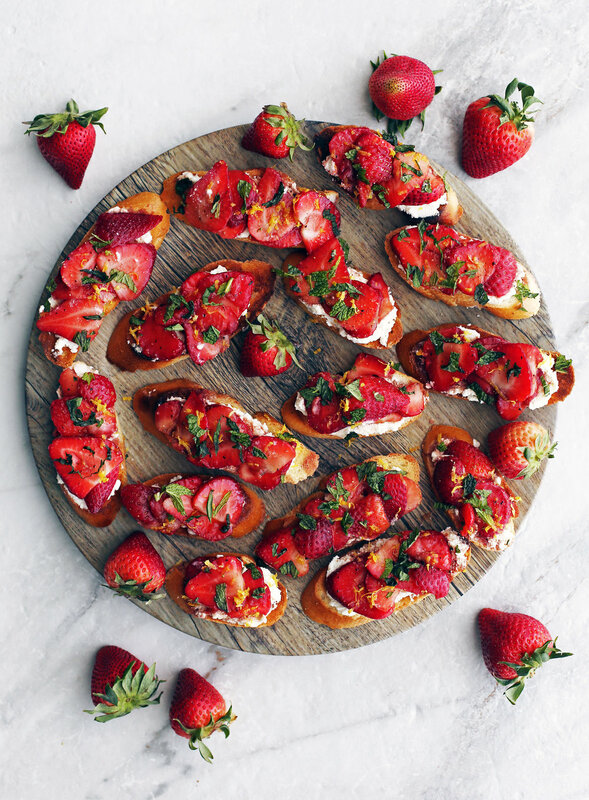 Anyway, I hope you enjoy this super easy and scrumptious recipe for Balsamic Strawberry Ricotta Crostini. Balsamic strawberries, ricotta, and toasted bread that's ready to be assembled into delicious crostini. Full ingredients and instructions down below in the recipe card. 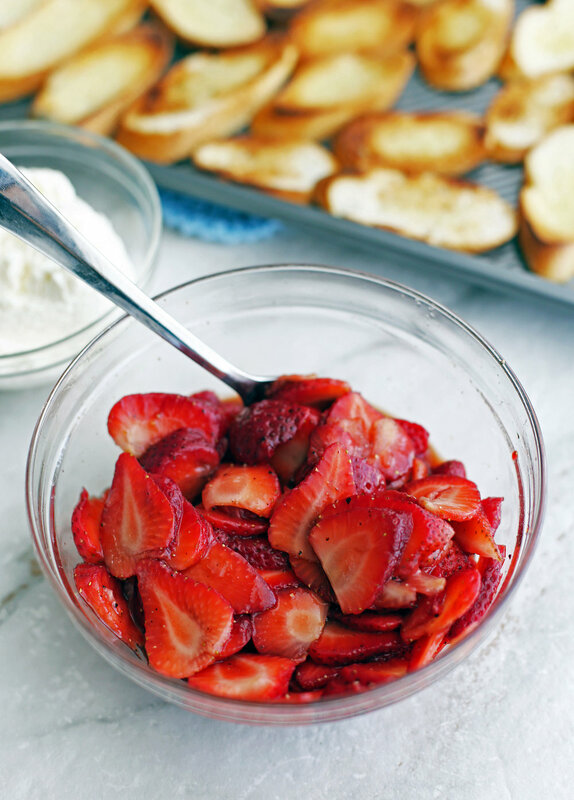 The sliced strawberries are combined with balsamic vinegar, sugar, and black pepper. 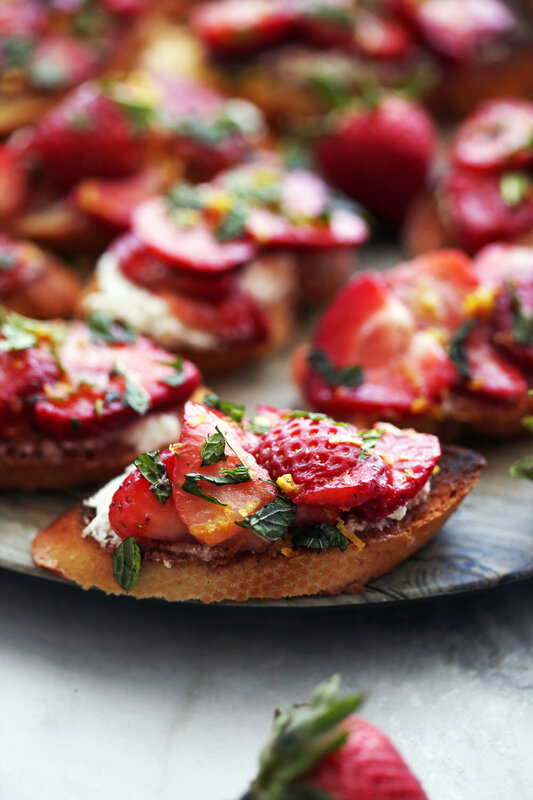 The star of this easy appetizer are the balsamic strawberries! It’s so simple to make as all you have to do is gently toss the ingredients together in a bowl and let the strawberries macerate to allow the juices to release and the strawberries to soften, while the other ingredients mingle together to produce amazing flavours. First off, balsamic vinegar and strawberries together is a winning combination. The tangy, sweet-tart flavours of the vinegar never overpowers the strawberries, instead it enhances the natural sweetness of the fruit. A light sprinkle of sugar and freshly cracked black pepper further intensifies the flavour of strawberries. These balsamic strawberries would be amazing on top of vanilla ice cream for a quick dessert or tossed into a light green salad for a light lunch. Then you get the bread. I like to use a fresh long baguette to make small, two or three bite appetizers, but you can most definitely use larger slices of toasted bread for a breakfast or snack. Or you can cut the slices into pieces to serve as a one-bite appetizer as well. For the baguette, I like to bake it, so it's mostly crispy throughout, but you can also broil the bread until it gets crispy on top if you prefer that method. For either method, I suggest keeping an eye on the oven while the bread toasts. It seems like the bread goes from barely golden to burnt in no time. I’ve burned bread so many times. If you burn the bread or parts of it (I find it happens as the back of oven may be a few degrees warmer than the front), you can try this tip: Take a box grater and using the smallest hole, grate the burned bits off. It will save you from having to throw away the whole piece. Then, you take each piece and top it with a layer of ricotta cheese. I like using ricotta as it’s creamy, mild, and slightly sweet. It’s also way lower in calories than cream cheese and a tad less than goat cheese (which would work as a wonderful substitute to ricotta). Perfect to spread onto a piece of toasted crispy bread. Finally, top the ricotta with the balsamic strawberries and finish with fresh lemon zest and chopped mint to give it a final bright and refreshing flavour! Delicious: Soft balsamic strawberries, creamy light ricotta, and a crispy bread that's full of tasty flavours and textures. Simple and easy to make: It’s really uncomplicated to prepare, but it looks elegant and colourful when finished. A lovely sweet and savoury appetizer or snack. Perfect to serve when you are entertaining: It’s finger food that’s easy to pick up and eat. For the balsamic strawberries. In medium bowl, gently toss the strawberries with sugar, balsamic vinegar, and black pepper. Set aside for 20 minutes. Toast the bread. In the meantime, slice the baguette into ½ inch pieces and brush olive oil over the top of each slice. Place the bread in a single layer on a baking sheet and bake for 4-6 minutes (at 425 degrees F), until the bread is golden-brown and crispy. Check frequently to make sure the bread does not burn. Assemble the crostini. Spread the ricotta onto each piece of bread (divide evenly among the bread pieces) before topping with the balsamic strawberry slices. Drizzle a light amount of balsamic syrup (leftover from the bowl) on top of the crostini. Finish by topping with lemon zest and fresh mint if you like. Best served immediately. *I used an 18-inch baguette cut on the diagonal resulting in larger pieces. If you slice the bread straight across, you will be able to cut 32 small crostini pieces. Nutritional calories represent one crostino.